The Germinatrix » Blog Archive » Get Your LOOT! Giving Away TREASURES! check out this PRIZE! who's gonna win? I'm so EXCITED! It is time for me to do MY book giveaway! I’ll bet you were all thinking that I was never going to give away a copy of the book I wrote – HA! I fooled you! 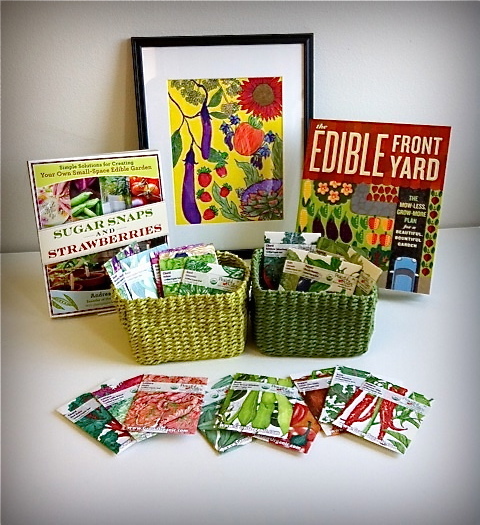 Not only are we giving away a copy of The Edible Front Yard, my lovely publisher, Timber Press, has generously added a copy of the Sugarsnaps and Strawberries (written by the amazing Andrea Bellamy of Heavy Petal) to the mix! And that isn’t ALL! The fabulous folks at GrowOrganic.com, the online home of Peaceful Valley Farm & Garden Supply, have created a special custom seed collection inspired by the “Supermodels” of ornamental edibles that I list in my book! 20 packets of gorgeous, certified organic, non-GMO seeds were donated – thank you Peaceful Valley Farm & Garden Supply (find them online at GrowOrganic.com)! The coolest, sexiest, warm AND cool season Supermodels Seeds will be sashaying their way around some lucky winner’s front yard – How awesome is THAT? And then there is a special present from me – a framed cartoon that I drew with my very own hands, depicting a few of the beauties that were making their presence known in my garden this year – before I ATE THEM! an image of my garden from The Edible Front Yard - pretty pics in this book, if I do say so myself! So here we go! Leave your comments and in one week, we will have a winner! Go crazy with your comments – woo me! The winner will be chosen randomly, but still – woo me! I like to be flattered and purred over, and I want to know how you plan on using this treasure chest of goodies should you win! 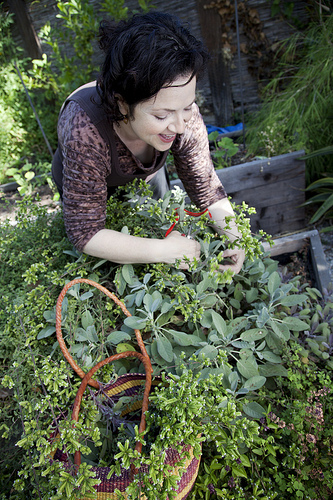 look how happy I am harvesting herbs! this could be YOU! leave a comment to win! Ooh! Ooh! Yum yum yummity yum. I can’t wait to plant all that stuff, front yard and back, and then EAT it. And feed it to my family, friends, and neighbors. And mention your awesome book every time I do. Thanks for the motivation. Now all I have to do is get my husband on board. March 2011 I had a fire in my home and it is being restored by the insurance company. I will be moving back into my home in September 2011 and I would love to have these goodies to start my gardens off right. Thank you for the lovely idea for a prize. I’ve been trying desperately to convince my husband to convert the front yard to edibles !Anything, IMO, would be better than the lackluster yellowish-green lawn & obligatory trees-in-circles … but edibles would be dream come true ! See, I’ve run out of space in the backyard to plant my veggies. And as the neighbors trees grow, that space is actually starting to shrink. A year without homegrown tomatoes ? I don’t think so ! I’d love to have these books to inspire me in the design & to help convince him of the project’s merit. I can’t wait to weave edible through my front perennial borders! I love the ideas of fresh food and flowers living in harmony. Cool, my backyard is already edible but the front could use some work! I am from the Philippines, am I qualified to join? I have been chipping away at the grass on my front lawn for years. 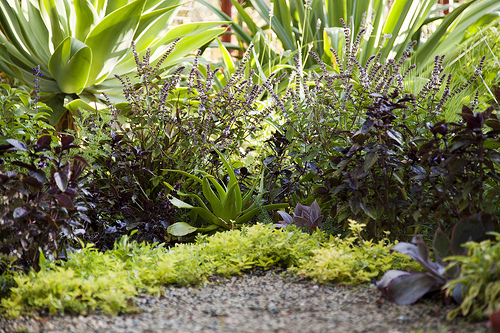 I think now is the time for me to make the final switch to a front yard edible landscape, especially since I have pretty much run out of back yard! I may have to pick up the Peaceful Valley pack. I just tole my husband how much I wanted your book last week! I found the fresh dirt blog yesterday, and today that led me here.. I think I’m meant to win this package! first i must say your shot of the front edible garden is gorgeous. i would love to plant these babies in my front edible garden we have dubbed our victory garden. thanks. I will use this package to turn my yard into a stunning edible and self sustaining paradise. It deserves to be so lush and lovely that no one in their right mind would ever want to leave it except maybe to buy a new hose or shears or whatever eventually wears out and needs replacing. And you Germinatrix would be the Garden Goddess Exemplar that would inspire such loveliness to come into creation! You would be the wick in the candle, the compost in the pot, the very birthing germ of a fantastical idea while I would be the spade of creation to bring this lovely package to fruition! Thank you thank you thank you…. True late bloomer. I feel I qualify as one of the true late bloomers since I’ve recently turned 60 and have decided edibles are even more exciting than planting for wildlife. I’ve done several canning attempts in the last couple months and am really enjoying myself. Would love to win your latest release as I’ve decided to move on from a backyard garden to utilizing the front this spring. Please add me to the potential winners list! Oh wow, too bad I had missed it. If I won, I would use this to learning more about gardening. Do you have any tips as where I can learn the basics of gardening?